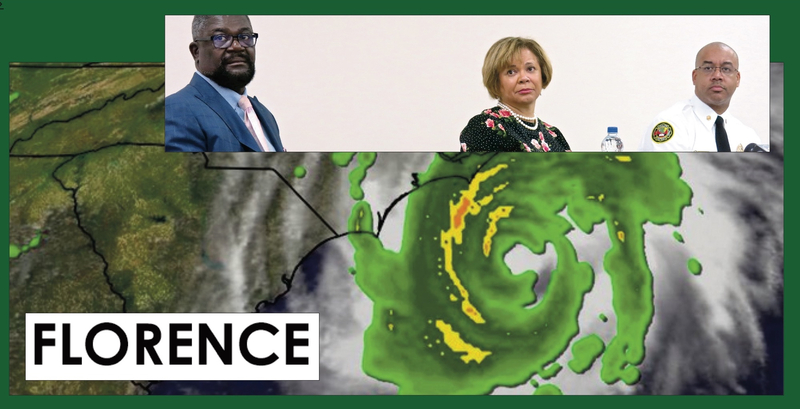 Community Relations Director Willie Ratchford, Mayor Vi Lyles and Fire Chief Reginald Johnson; radar view of Hurricane Florence. There were many plaudits from Forum participants today for city officials on how Charlotte’s uniformed and ununiformed service personnel responded during Storm Florence. One of the focuses of the presentation was on preparation and how technology and modern practices were improving emergency response. More important for the next storm, however, was that Fire Chief Reginald Johnson, Mayor Vi Lyles and Community Relations Director Willie Ratchford appeared intent on listening for citizens’ suggestions on how to be even better prepared for the next go-round, when there might be more water, more damage, more lives in direct danger. In the video below, the presentation begins at minute 9:00. The Q&A begins at minute 19:40.